Living in Upstate New York, we’re pretty used to unpredictable weather in January. The last few years, however, it hasn’t been too bad so we’ve been feeling pretty confident about making plans in advance. The plan? Girls’ night out. Dinner and a movie. A chance to catch up after the holidays. We picked a Tuesday night because it’s only $6 at our local cinema. And then Mother Nature decided to throw us a curve ball by blessing us with sleet and freezing rain. We’re not afraid of snow but we do NOT mess with ice. Time to move on to Plan B. A nice dinner at home with Mark and a glass (or two) of red wine. Lately I’ve been in a bit of a food rut. I feel like I’ve been making the same things over and over so I was pretty excited when I got my weekly email blast from my local butcher, Primal. 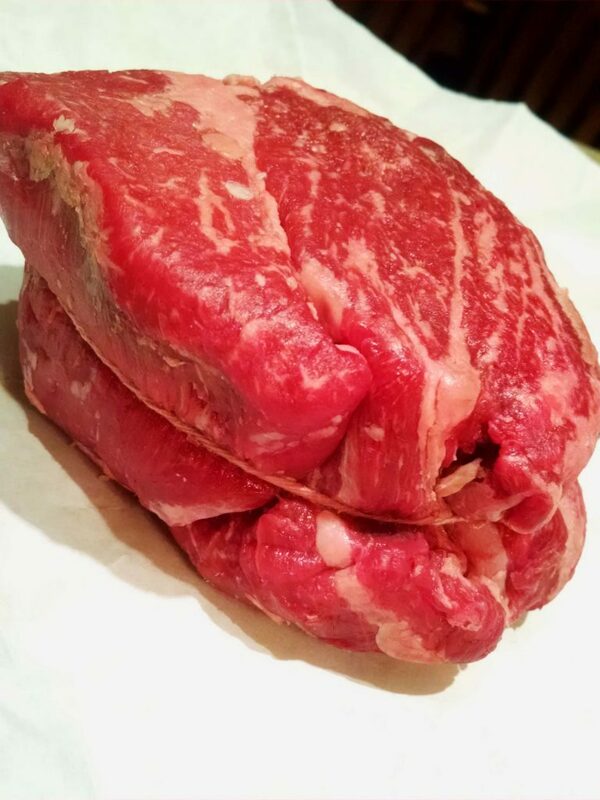 Featured for $4.99 a pound ($2 off regular price) were Chuck Eye steaks. At first I thought it was a typo. Maybe someone meant to type Rib Eye or Chuck Roast and got mixed up. But, no, it wasn’t a typo. Chuck Eye is really a cut of steak and is sometimes called the poor man’s rib eye (ribeye – I think both are acceptable). Rib eye’s come from ribs six through 12; chuck eye is cut from the fifth rib. I don’t care where it comes from, it’s freaking delicious. And super easy to cook. For the record, rib eye IS my favorite steak. 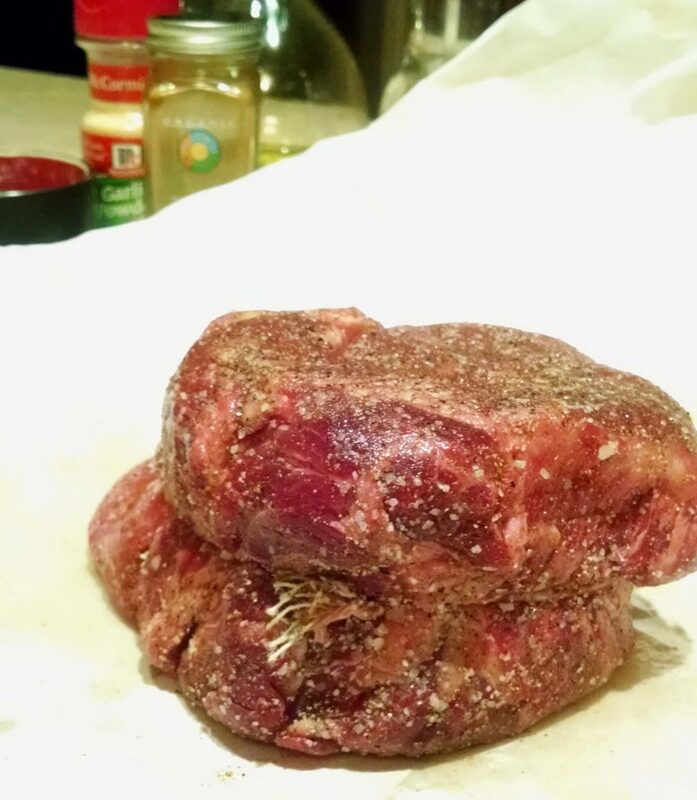 Since the chuck eye would have a similar flavor I just sprinkled kosher salt, freshly ground pepper, garlic powder and paprika over the entire steak. Then rubbed a light coating of olive oil on it while it was coming up to room temperature. We grill year round. It was raining and a little icy on the deck but that wasn’t going to stop me. It was too yucky outside to deal with the Big Green Egg. It was just plain easier to light up the gas grill. You’ll want to turn on all the burners to get it nice and hot. Be sure to make sure your grates are clean too. Now you’re ready. Sear each side for five minutes and then turn off some of the burners to create an indirect cooking zone. Move your steak to the indirect zone and cook to medium/medium-rare. Depending on your steak’s thickness, it should take 20-25 minutes. I pulled ours at 130F and let it rest for about 10 minutes. We kept our dinner simple. One of my favorite salads and French bread rounded out the meal. Mark kept calling this a Chucky steak. I don’t care what he called it. This is now my new favorite steak. Will have to go and get more and toss them in the freezer while they’re still on sale. On a side note, apparently Steven Tyler from Aerosmith WAS AT THE SAME MOVIE THEATER that we would have been at. Seriously. We missed STEVEN TYLER!!! It’s probably just as well because if he had seen me, he would have wanted to run off with me and I just don’t have time for that in my life right now. Perfectly cooked. 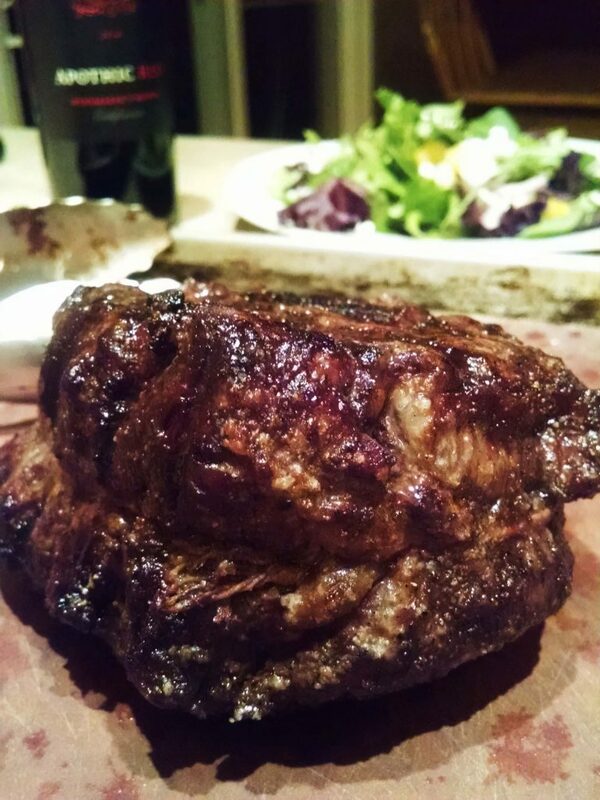 My new favorite steak is the Chuck Eye. If you can find it, try it. You won’t be disappointed. Now that Justin’s back to school, we also have enough for leftovers. I see a steak sandwich with horseradish sauce in my future. I call dibs! 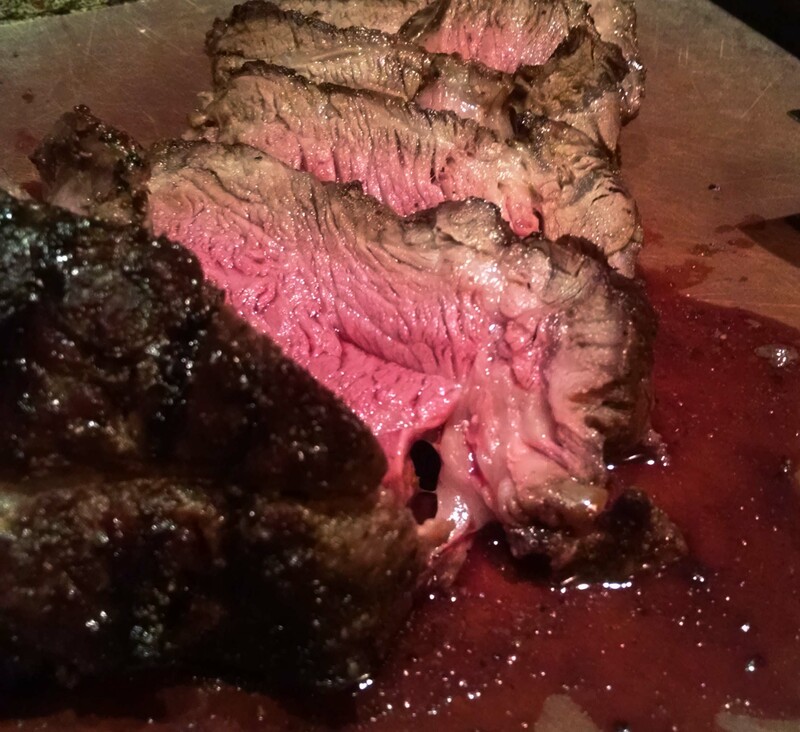 Have you ever had a chuck eye steak? How did you prepare it? What did you think?